Once your kitchen is stocked with Mexican cooking ingredients they’ll spread out and influence just about everything you make. In a good way! Second place would go to… jalapenos. 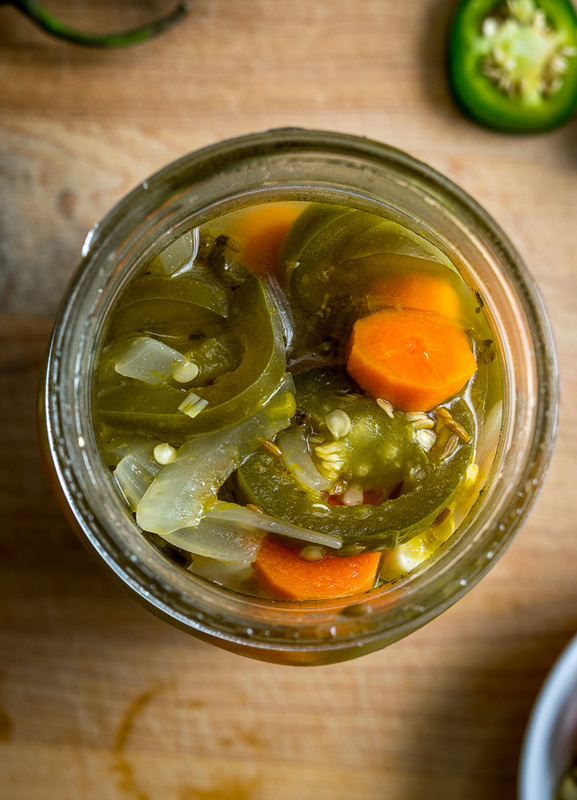 We are using a batch of our homemade Pickled Jalapenos but store bought will work in this recipe too. 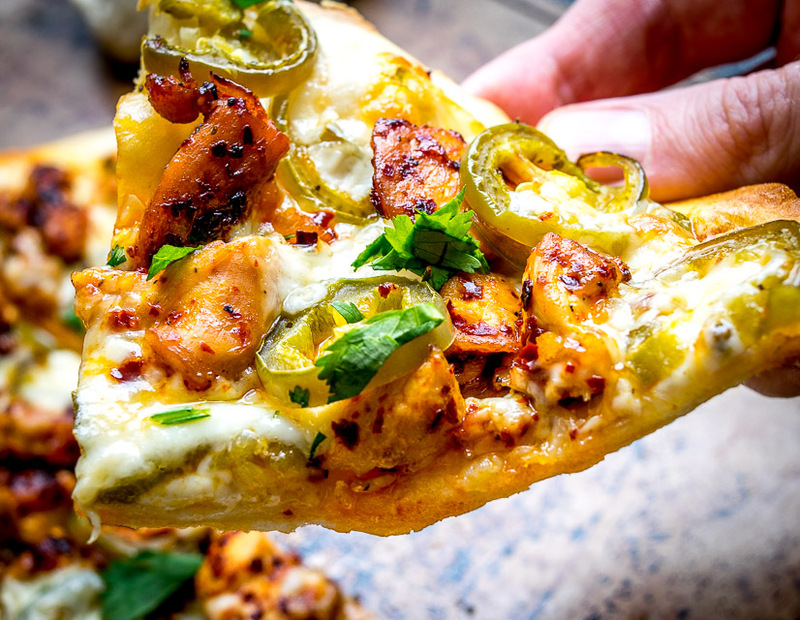 It’s tough to say exactly why pickled jalapenos work so well on pizza, but trust me they do. If you’ve never tried ’em on pizza before then push it towards the top of your to-do list. I’m using a simple pizza dough recipe from the kitchn but with slightly less salt. You can start by adding 1 teaspoon of yeast to 3/4 cup of warm water. 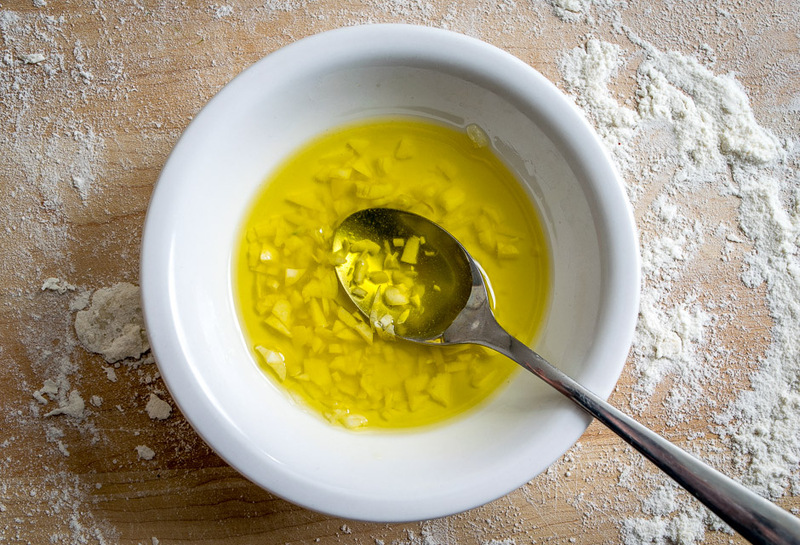 Give a stir until the yeast has dissolved and then add 2 cups all-purpose unbleached flour and 1 teaspoon of salt. Mix as much as you can with a spoon and then dump onto a cutting board or countertop. 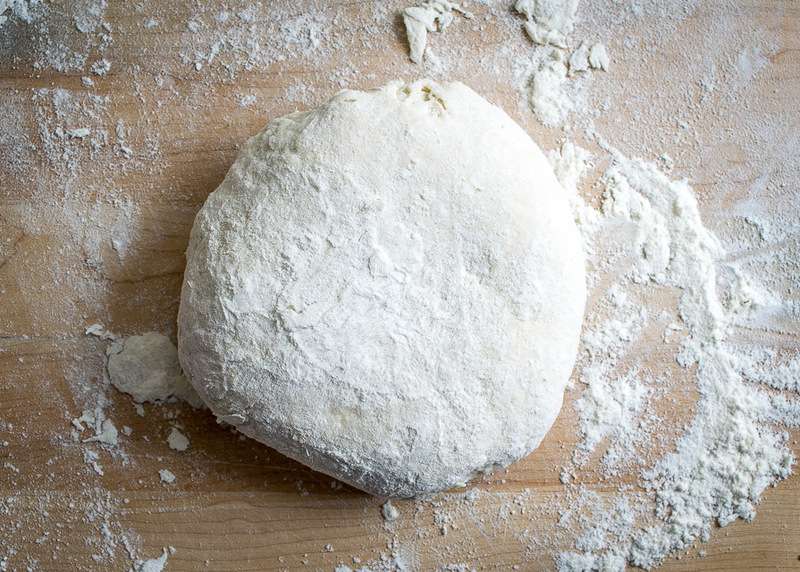 Use your hands to knead this into a cohesive ball of dough. It’ll take a few minutes and if the dough is sticking to your hands add a generous sprinkle of flour. Ideally this dough rises for 1-2 hours, but you are hungry right? I never wait that long and usually just cover it with the mixing bowl for 30 minutes or so. This is enough dough for four thin crust 10″ pizzas. I usually make two pizzas and save the other half of the dough in the fridge. Just wrap it in plastic and foil and it will keep for at least 4-5 days. First let’s talk about the sauce. Or lack of sauce I should say. I’ve tried this recipe with tomato-based sauces and the results were not nearly as good as using a simple garlic infused oil as the “sauce”. This is 2 Tablespoons olive oil, 2 minced garlic cloves and a pinch of salt. A thin layer of this is enough to keep the focus on the chicken and pickled jalapenos without the pizza tasting dry. If pizza without SAUCE seems wrong, then you are in for a pleasant surprise. Smoosh the garlic into the oil using the back of the spoon, this will amp it up a bit. And consider 1 Tablespoon of oil per pizza the maximum amount, even just 1/2 Tablespoon is enough to keep the pizza from tasting dry. 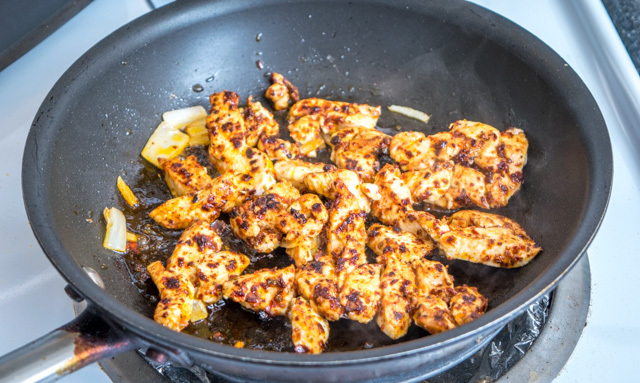 A chopped chicken breast gets tossed with this mixture and then cooked over medium-high heat. Since the chicken will be baked in the oven you don’t need to cook the chicken all the way through, 70-80 percent will do. Split the dough in half, and then split one of the halves in half. This will roll out into a super thin 10″ crust. It can sometimes be easier to get it thin if you roll it out in stages, i.e. do a rough first pass, let it sit for a few minutes, and then come back for a second pass. Keep some flour nearby. If it’s sticking then a light sprinkling of flour on the rolling pin or dough should take care of it. For the second pass consider rolling it out on parchment paper, then you don’t have to worry about it sticking to your work surface and it can be cooked directly on the parchment paper. Your setup might vary, but I’ve gotten the best results by baking this dough by itself for 1-2 minutes and then adding the toppings. This seems to help the center cook through before the edges get burnt. It’s one of the workarounds for not having a pizza stone but don’t worry, you aren’t sacrificing any flavor by cooking it this way. So we are adding the garlic-oil after the dough has already baked for 1-2 minutes at 400F, as pictured above. 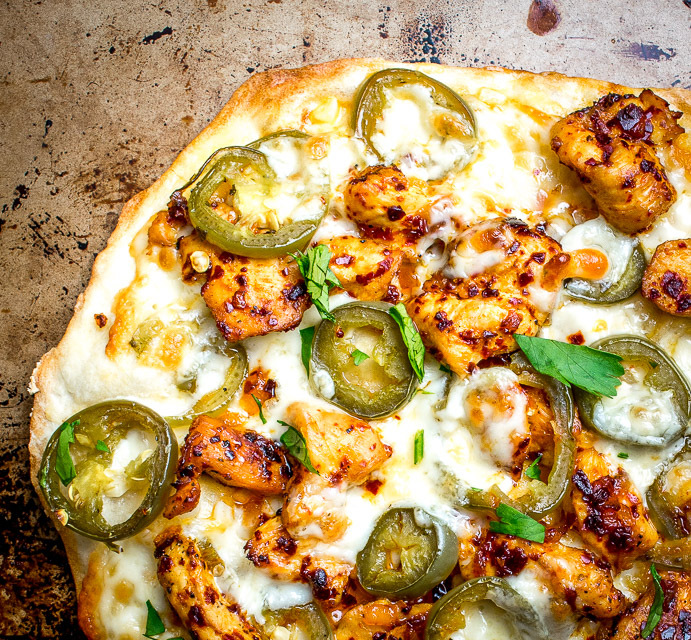 And then it’s just a matter of adding the pickled jalapenos, chicken, and cheese. This will bake at 400F for 8-10 minutes on an everyday sheet pan. When the edges start to darken you are moments away from a true delight. Serve immediately as it tastes best right out of the oven. Who knew pickled jalapenos were so comfortable on pizza? So good! Optional garnishes include chopped cilantro, Crema if you are feeling crazy, and of course, more pickled jalapenos. P.S. We recently used the same techniques to make a delicious Pickled Tomatillo and Chorizo Pizza. 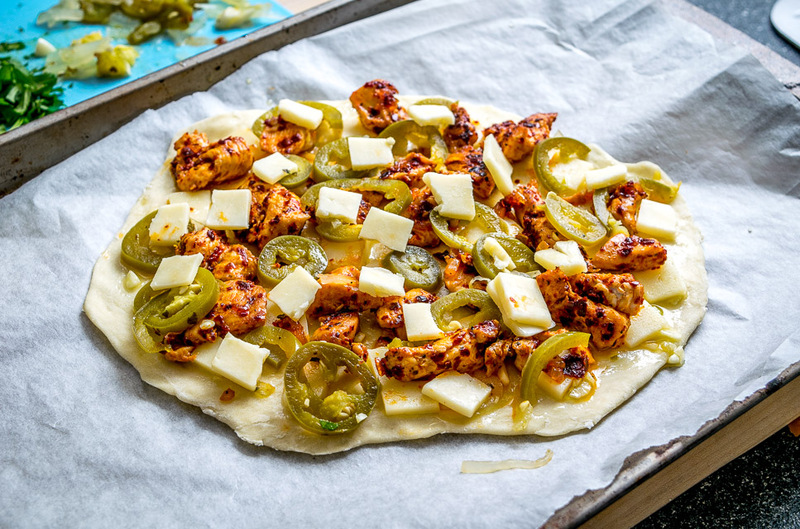 This Spicy Chicken and Pickled Jalapeno Pizza is the perfect example of Mexican cooking ingredients influencing just about everything in my kitchen. A super easy and delicious recipe with no special pizza gear needed! 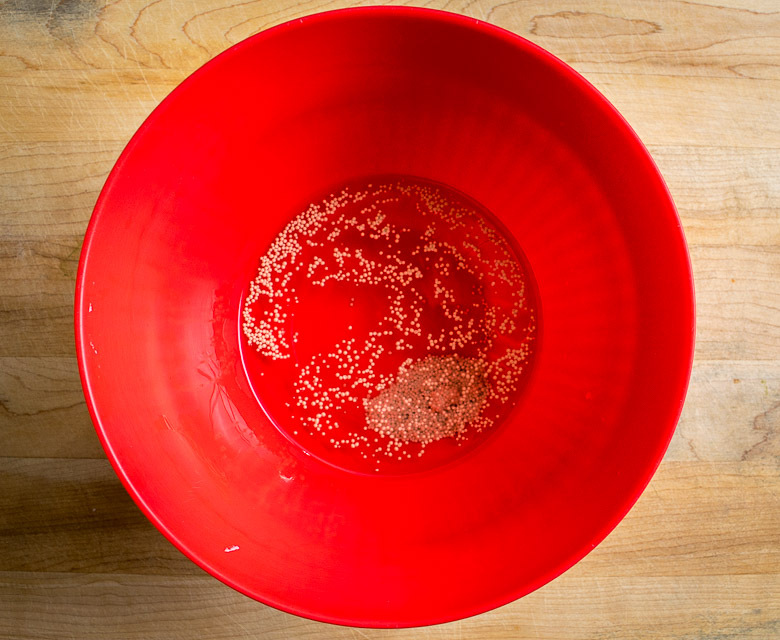 In a mixing bowl, add 1 teaspoon of yeast to 3/4 cup warm water. Stir until the yeast has dissolved into the water. Add 2 cups flour and 1 teaspoon salt. Combine as much as you can with a spoon. 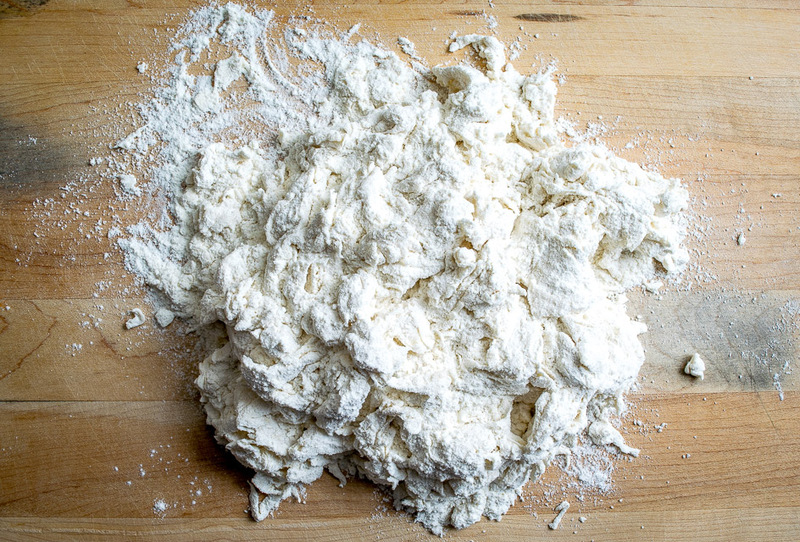 Dump flour mixture onto a work surface and knead with your hands until a cohesive ball is formed. If the dough is sticking to your fingers add a bit more flour. To make the garlic-oil sauce, finely mince 2 garlic cloves and add to 2 Tablespoons olive oil along with a pinch of salt. Smoosh the garlic into the oil using the back of a spoon and set aside. 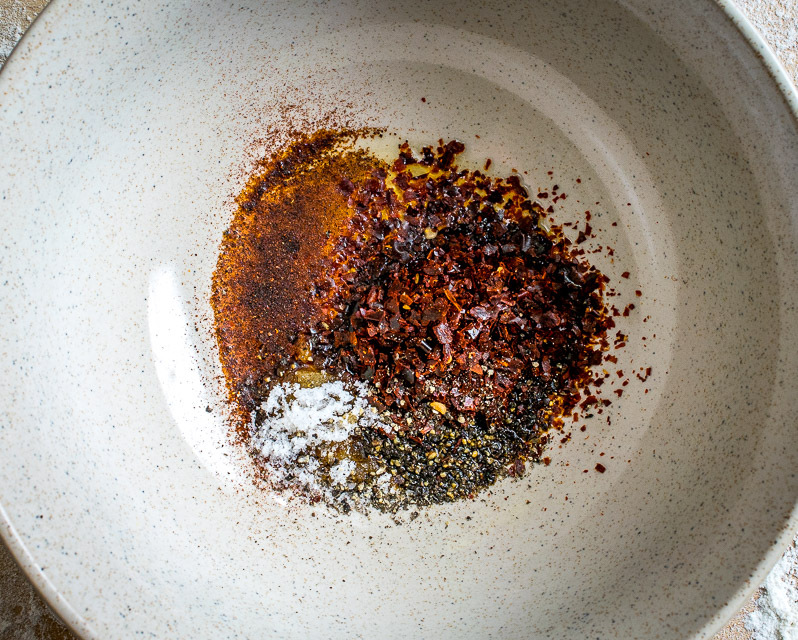 Chop a single chicken breast into bite-sized pieces and combine with the listed seasoning ingredients in a bowl. Saute the chicken in a drizzle of oil over medium high heat until slightly undercooked. Set aside until needed. Tear the dough ball in half, and then tear one of the halves in half. This will be enough dough for a super thin 10" crust. 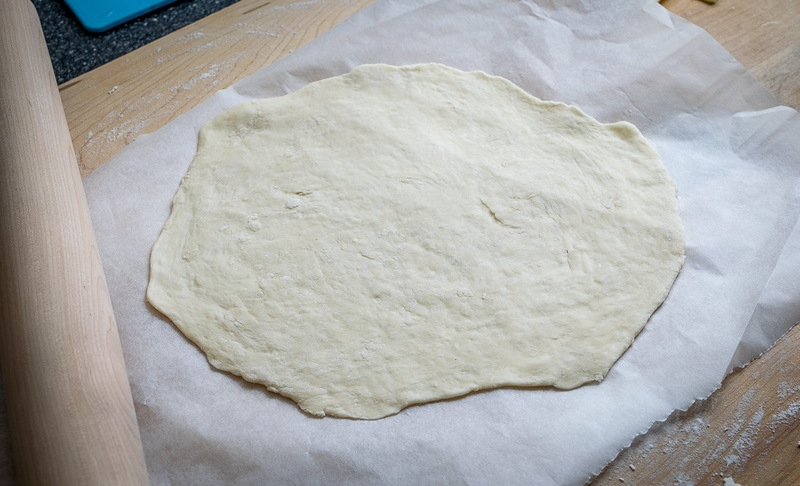 Give it a quick roll out with a rolling pin and then let it sit for couple minutes, this will reduce the elasticity. Then you can roll it out to your desired thinness. 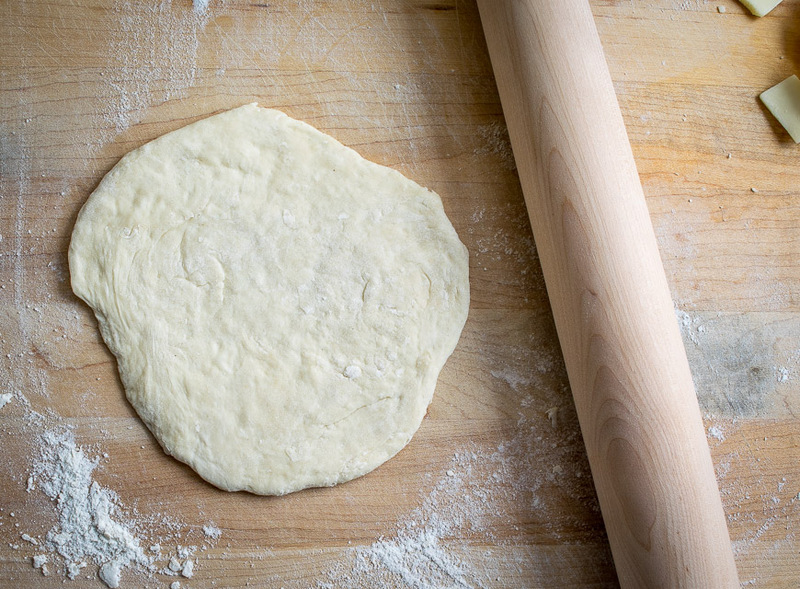 Rolling the dough on parchment paper can be easier as it won't stick as much. 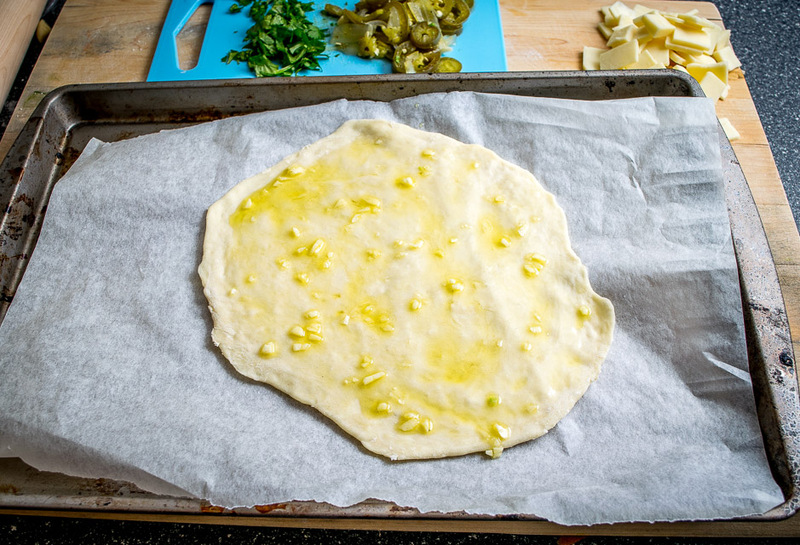 You can also bake the pizza directly on the parchment paper. For my kitchen setup, I start by baking the rolled-out dough for 1-2 minutes at 400F. Then add a thin layer of the garlic-oil sauce, followed by the chicken, cheese, and pickled jalapenos. Bake at 400F for 8-10 minutes, or until the edges start to brown. Optional garnishes include chopped cilantro, Crema, and more pickled jalapenos. Don't forget to slightly undercook the chicken. This will keep it from drying out when baking in the oven on the pizza. It takes very little of the garlic-oil sauce to keep the pizza from tasting dry. One Tablespoon per pizza is the upper limit, I probably end up using only 1/2 Tablespoon per pizza. This dough recipe is enough for four 10" thin crust pizzas, but the listed ingredients for the toppings are for two pizzas. You can wrap the remaining dough in plastic and foil and it will keep in the fridge for at least 4-5 days. One last thing to note...I like this recipe best when the crust is super thin. 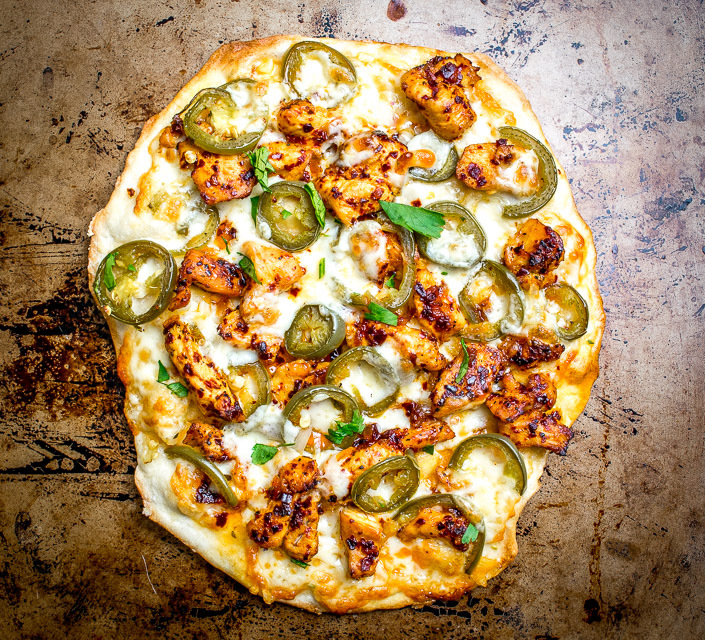 A light, thin crust keeps the focus on the chicken and pickled jalapenos. I've tried it with thicker crust before and did not like it as much. Oh goodness, this looks incredible! Literally drooling. Homemade pizza is a big hit around our house. This looks so Amazing! I’m going to have to go make this right now! I love Mexican food and I’m so glad I discovered your site. This is my kind of pizza! Definitely putting this in my recipe queue. This looks awesome! 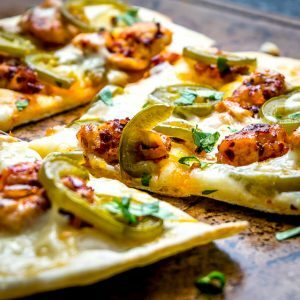 I’ve had a chicken jalapeño pizza before (which was good), but they didn’t season the chicken much… yours looks much better with the added spices. Love this pizza! I would love to attempt this Deep Dish Style. Is there a thicker sauce you might recommend ? Hmmm tough question! I always make this pizza with thin crust and the garlic oil acting as the sauce. I’ve made it with thicker crust before as an experiment (just by not rolling it out as thin) and I was disappointed with the result. Without a traditional sauce the dough/crust overwhelmed the toppings. Sometimes I make a more traditional version using sausage and tomatoes as the toppings. Instead of making a classic pizza sauce, I just use some canned, drained tomatoes (or sometimes sliced roma tomatoes). This combined with the garlic infused oil makes for an awesome pizza and might be worth experimenting with. Hope that helps a little bit. Thanks much for your note! Is this 880 calories per slice? Or the whole pizza or? Please help. Hi Shy, it’s 880 calories per pizza. Let me know if you have any other questions. Cheers. Ha thanks Bri, so glad you found this recipe! It’s been months since I’ve had this pizza and am now officially craving it! Just made this today and it was delicious!!! I wish I could post a picture. I had to tweak the recipe as I didn’t have chipotle powder (I had a packet of McCormick Grill Mates smoky Ranchero mix) and used that for my chicken. Thanks Chelsea! Yeah definitely lots of leeway on the chicken as the key seems to be the pickled jalapenos and the garlic oil layer. So glad you enjoyed it!